LOS ANGELES, Calif. /California Newswire/ — It has been an enormously successful year for almost two dozen Everest Foundation Scholars who are actively working on research projects for submission and hopeful publication in esteemed medical journals as well as starting their medical residency training in coveted ACGME Accredited residency programs across the U.S. The Everest Foundation is a non-profit organization that supports medical research, domestic and global health initiatives and even residency positions with a number of U.S medical schools and community-based hospitals. With a mission statement that spells out its mandate: “Part of the Cure,” The Everest Foundation has a laser focus on the advancement of (GME) Graduate Medical Education during these exciting and challenging times for U.S. healthcare. This year, two distinguished Everest Foundation Scholars were recognized for their extraordinary gifts. Dr. R. Sahni, a medical graduate from India, was awarded “Resident of the Year” at the University of Alabama SOM Internal Medicine Residency Program; and Dr. Milad Modarresi was awarded first place in the state of West Virginia for his research poster presentation at the 12th Annual West Virginia Geriatric Society Scientific Assembly. Sahni has also been featured in a nationwide webinar for Residents Medical which platformed his commitment to gain the skills and experience for residency while Modarresi was later highlighted for a second time as a researcher with West Virginia Congressman, Evan Jenkins, at a conference focused on opioid use and problems facing the state. Sahni had been an Everest Foundation Scholar for two years overseeing research projects and publications at both New York’s Icahn School of Medicine at Mount Sinai and the James A. Burns School of Medicine at the University of Hawaii, respectively. Initially, having trouble obtaining a medical residency, Sahni was recommended to The Everest Foundation by Residents Medical, an educational company in California that specializes in preparing medical students and graduates a strong CV necessary for residency by making them prolific researchers and clinicians. This pathway has worked for many Everest Foundation Scholars throughout the years, including Sahni. The pathway worked for Sahni who matched in SOAP last year, in part due to his excellent research work at Icahn and at Burn Schools of Medicine, respectively. This year, Modarresi matched into a General Surgery program at Marshall University Joan C. Edwards School of Medicine, where he was doing his lauded research work as an Everest Foundation Scholar and Fellow in Orthopedics. It’s no secret that research publication in any specialty often ranks residency candidates higher when applying for GME positions, according to many program directors. “Part of our mission is to support the ‘six core competencies’ of the ACGME with all of our initiatives and Scholars, so we hope to continue to make a positive impact on GME programs across America,” Mrs. Agata Everest, chairperson of The Everest Foundation, says. Mrs. Everest, a former healthcare clinician from Europe, underscores that U.S. and foreign medical graduates (FMGs) know that the application competition for residency is getting tougher and tougher. Every year, The Everest Foundation helps many of its research scholars and fellows into residency as they work to navigate these daunting numbers. Projections for the years ahead look equally challenging. So, graduate medical students and graduates who conduct real paradigm changing research and clinical work with The Everest Foundation are reaping positive benefits. By supporting medical residency training programs, our foundation addresses both the great “Bottleneck” of medical school graduates looking to land a medical residency slot and address the doctor shortage in America. We get to see many of our Everest Foundation Scholars and Fellows become board certified doctors, all the while supporting Residency Training Programs and Graduate Medical Education at Schools of Medicine who don’t always get all the support they need. The Everest Foundation is engaged in clinical, research at various U.S. medical schools and ACGME teaching hospitals across the country. It sponsors numerous collaborations nationally in various specialties including: Internal Medicine, Physical Rehabilitative Medicine, General Surgery, Orthopedics and Psychiatry. Organizations, teaching hospitals, medical schools or health systems that are interested in an alliance with The Everest Foundation, should visit: http://theeverestfoundation.org/ or call 310-477-7800. 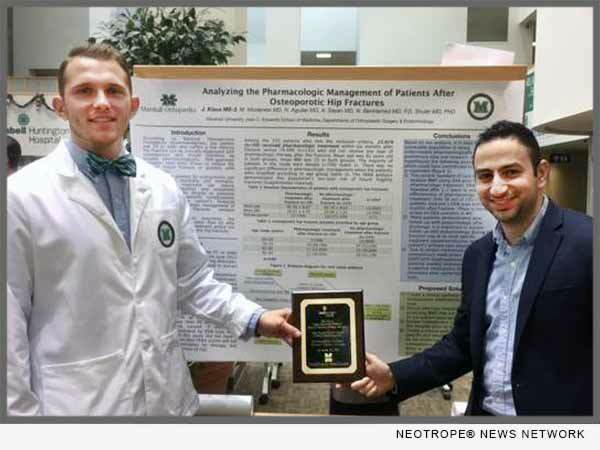 *Photo Caption: Dr. Milad Modarresi was awarded first place for his research poster presentation at the 12th Annual West Virginia Geriatric Society Scientific Assembly.